"Between April 17 and 23, 1921, Percy Grainger became the first pianist of international fame to play at a moving picture theatre. This took place at the Capitol Theatre (New York), which at that time was the largest cinema in the world, capable of seating almost five and a half thousand people. Grainger played to capacity audiences four times a day and the highlight of each performance was a rendering of the first movement of Tchaikovsky's First Piano Concerto which he played alternately with the Duo-Art piano roll being fed through the Steinway he was using." We also learn that "through the late twenties and early thirties onwards, his diaries show that he had become an ardent film-goer;. His favourite film stars seem to have been: Marlene Dietrich, Ginger Rogers and Ingrid Bergman. Amongst his students were Bernard Herrmann and Morton Gould. "They treated him as a friend rather than as a representative of the stuffy academic establishment. Grainger did not place orchestration examples before them; instead he allowed them to choose their own pieces and gave them advice where and when needed. Herrmann, for instance, decided to orchestrate MacDowell's 'Celtic' Sonata and felt the need to employ the sonorities of a tenor tuba. Grainger knew little of this unusual instrument, so together they familiarised themselves with it and found suitable moments for its inclusion." 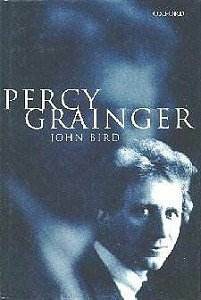 By the way, a film based on episodes in the ligfe of Percy Grainger was made in the late 1990s by an Australian production company. Stills from the production were shown to delegates at the 1998 Percy Grainger weekend but as far as I can gather there are no plans to screen this film either here in the Uk either in theatres or on television.